Ok, your comments on the Call for Motivation post did what they were supposed to. I am now officially motivated again. The spiders have been swept out of the garage and the box has been dusted off. 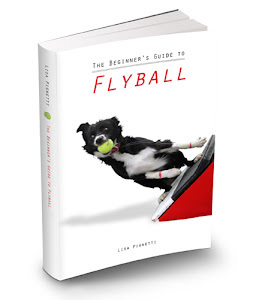 Thank you, flyball friends! The advice that really resonated with me was that I should just set a goal to train for five minutes a day (or a cheese stick, whichever ran out first). I actually do use cheese sticks to train my dogs, so that part made me smile. I realized that part of my problem was a "Perfect is the enemy of the good" sort of quandry -- I have several dogs that need flyball-related training, and not enough time to work with them all, so I wasn't working with ANY of them because I couldn't work with ALL of them. So the first step was to pick ONE dog to focus on. I picked my border staffy Fringe (aka The Project Dog), since she will be a height dog and it would be really nice to get her up and running. I then vowed to train Fringe for five minutes every day. Day 1 went great. On Day 2, I copped out and didn't do any training. Argh! But yesterday (Day 3), I worked with Fringe on the box again, and it made me happy. That's when I realized that the "every day" part of the training plan wasn't going to work for me -- it's just like if I say I'm going to exercise every day, or write every day, or stick to my diet every day. When I miss a day -- and inevitably I do -- I feel like a guilty, lazy loser. So okay -- I'm working with just Fringe right now, for five minutes (or a cheese stick), every day or so. Totally doable. Hope everybody has a happy Friday (or "Flyday" for those of you heading off to tournaments this weekend)! I have made "days" for my dogs and it seems to help. Like, "It's Whippet Wednesday!". You gotta resort to stuff like that when you have a pack of 'em!